The Swedish homewares store proves that you can flat pack just about anything! If you love IKEA, chances are you also love the challenge of flat pack furniture, but it turns out that the store offers much more than just the perfect storage solution or kitchen fit out. 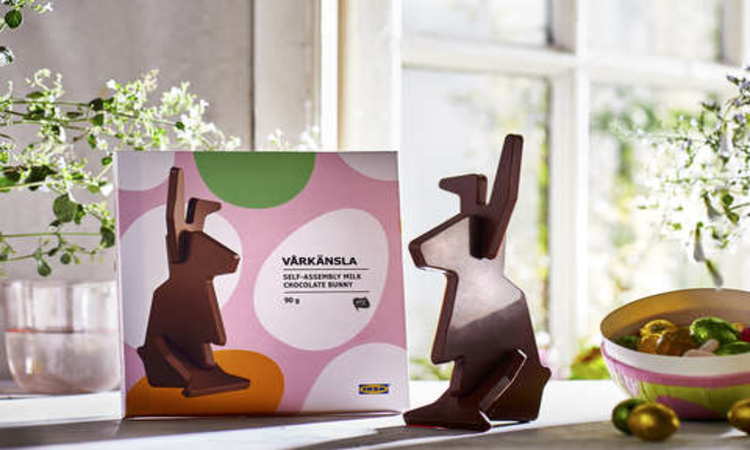 The Swedish retail giant has released a flat pack edible Easter bunny just in time for chocolate season, and it combines all the joy of self-assembly with delicious milk chocolate. The do-it-yourself chocolate comes in three parts that are neatly placed together to create the Easter bunny, without a single screw or set of instructions in sight! The ears, body and legs slot together allowing the bunny to stand completely upright. The product is not only a bit of fun, but is also sustainable, using UTZ certified cacao. IKEA says that the bunny can also be used as a cute Easter decoration, but the Aussie heat and temptation for little tummies means we can’t see it lasting long enough for that! The flat pack Easter bunnys are $6 each and expected to remain in IKEA stores until June. We think they’d make an amazing Easter craft activity for kids over the school holidays, or a super cute alternative to a party bag if your child’s birthday is in the lead up to chocolate season! What do you think of IKEA’s flat pack Easter bunny? Let us know in the comments! Surely different!! I would love to try to find one for my daughter!! I love it and such a great idea for the Ikea enthusiasts. Ha. Its so cute! I’d definitely get some. I have a feeling there might be some sticky fingers when assembling this chocolate bunny! Love this flat pack chocolate bunny! Such a fun idea!